As the Latin saying goes, "unity is strength". This motto is strengthened within the UD Las Palmas. To understand the history of this club is better to understand first the circumstances of canary football from late forties. The Canary Islands were always prolix land of footballing talents. Players with an innate talent, envied and desired by clubs from the main land since nearly a century ago. The already legendary stars of our football continually emigrated to other teams, back in the forties forced by the inability to retain them in the canaries clubs. The constitution of the UD Las Palmas, in 1949, ended with this situation. The five teams which at that time made up the regional championship of the island (Marino, Victoria, Gran Canaria, Athletic and Arenas) joined forces to create a single team to represent the island. After a long process of negotiations, on 6 June 1949, the Spanish Football Federation approves the inclusion of Gran Canaria teams in national competitions. Two months later, on August 22, the UD Las Palmas official establishment took place. A Management Committee would take over the new club. Two facts favored by the definitive boost of popular sport in Gran Canaria. To first division in no time. On Friday September 16, 1949 takes place the first training of UD Las Palmas. A selection of the best players founding teams coached by Pancho Arencibia. In a magnificent first season, the yellow team gets the promotion to the Second Division after winning first place in the regional competition and second place in the little league to promotion. The following season, after another excellent footballing career, the UD Las Palmas achieves a new promotion to First Division: only in two seasons time, the team manages to reach the top flight of Spanish football. It is a milestone that no other team has been able to emulate so far in the same period of time. Return Flight to First DivisionThe premiere of the UD Las Palmas in First Division was short-lived, for just one season. During that championship, the team just moved away from the relegation zone in the standings. At the end of the season, the yellow team relegation to the Second Division. Still, no one could wrest the dream of rubbing shoulders with the biggest clubs in national football during that season, in which they walked the name of the island across the country. The UD Las Palmas in 1952-53 season begins a new season in Second Division with the aim of returning as soon as possible to the newly loss category. However, the feat accomplished for two years was impossible to repeat that season. Yellow stood at the gates of promotion. In 1953-54 season, the Union Deportiva achieved the second promotion to First Division. A great season, especially the splendid second round allows the team to promote. The feat was corroborated with a draw at the Heliodoro Rodríguez stadium, thanks to the points obtained in the previous meetings. The second attempt by the UD Las Palmas must mean the beginning of a process of stability in the top flight, as in the previous three seasons, the club had suffered two promotions and a relegation. The 1954-55 season was content as the ideal way to achieve a definitive position as First Division team opportunity. This was achieved during the following six seasons: the great period allowed the grancanaria firme be recognized in the national football scene. In 1955-56 season, the Union Deportiva started the championship so brilliant. A great first turn causes yellow team reach half of the championship in third place, coming to hold the lead for a few days. That triumphant pace was not sustained in the second round, and the UD Las Palmas saves the category during last days. During these years, the game displayed by the canary team was characterized by an unmistakable style. Yellow players were conspicuous by their class and technique, and tore applause wherever they were playing. In season 1956-57, they return to Gran Canaria to play with the yellow team Alfonso Silva and Rafael Mujica, from Atletico Madrid. Two canaries in the prestigious national competition return to their land to share with the yellow fans their last years. Both signings, combined with the great squad that the Unión Deportiva had at that time, make up a great team for that season. As in the previous year, the team finished the season in a low position. In the following two seasons, the Union Deportiva saved, however, the category in extremis. In the first one, after a remarkable final championship, the yellow team obtains the right to stay in the elite in the last day. In the subsequent season, the yellow team were driven to the promotion against Levante, saving the category. Finally, in 1959-60, the yellow team consummates the relegation to the Second Division after a dismal season, ending the longest period in honour category. The difficult beginnings of a golden generation. The relegation to Second Division after a long period in the elite, led the Unión Deportiva Las Palmas a crisis in the early sixties. Hiring foreign players, an unknown fact in the yellow club, resulted as a loss of identity in the club. However, in parallel, in the lower echelons of the team, it was forged a generation of players who, ultimately, lead the club to the best years in its history. Tonono, Guedes, Castilian or German were part of the short list of stars that blunted from an early age in the Yellow Academy. Thus it was forged the so-called "golden age", which allowed the Unión Deportiva Las Palmas be maintained for nineteen seasons in First Division. An enviable and unprecedented record that also encompasses a Cities Fairs Cup (UEFA subsequently), characterized by a defined playing style, technique and precious excellent game. In 1963-64 season, the Unión Deportiva Las Palmas, under the technical management of Vicente Dauder, achieved the third promotion to First Division. This is the kick off to a brilliant football career in the elite. Four seasons later, in 1967-68, that team starts to reach their best levels. That season they achieved a third place after a tough battle with Real Madrid and FC Barcelona for the league championship. The next season, the Unión Deportiva improved the result of the previous championship, with the runner-up League, being so far the best team ranking in its history. During 1969 the first participation from the yellow team took place in the European competition. A nil-nil draw against Hertha Berlin in the Estadio Insular and a defeat by the minimum (1-0) left the yellow team out of the next round. For the Sweden Eurocup in 1968, the Spanish team had four yellow players (Tonono, Guedes, German and Castilian) and subsequently Marrero Martin was summoned to the qualifying rounds of the 1970 World Cup in Mexico. Farewell to Guedes and Tonono. The beginning of the seventies was marked by various adverse circumstances that marked the history of UD Las Palmas. On March 9, 1971 dies Juan Guedes, mythical yellow player and one of the historical grancanario stars, at the age of twenty-eight, while he was still an active player. This caused a stir great shock on the firm and generally throughout society on the island. Still, the Union Deportiva knew counteract this unfortunate loss. A magnificent season 1971-72 with the French coach Pierre Sinibaldi, allows the return to European club competitions. In this second participation, the yellow team got to move steadily second round, leaving in the lurch important teams such as Torino and Slovan Bratislava to be eliminated in the third round by FC Twente Dutch. In 1975 Tonono, large central yellow player and one of the best in the history of UD Las Palmas, dies of liver infection as it happened with his partner and friend John Guedes. The grancanario team loses one of its most important strongholds. In 1973-74, the Unión Deportiva Las Palmas hires Argentine goalkeeper Daniel Carnevali. This contract marks the beginning of signings from that nationality which would make up the backbone of the team and an indelible time in the retina of the Canary fans. Followed by Carnevali came Quique Wolff, Carlos Morete and Miguel Angel Brindisi. These outsiders, together to the yellow players were setting a block under the command of Miguel Muñoz, reached the third and final participation in European competition for the club. In 1977-78 season the UD Las Palmas wins the UEFA Cup at Sloboda Tuzla in the first round, to fall eliminated by Ipswich Town. Also, this season, the yellow team reach the final of the Copa del Rey, which were defeated 3-1 against FC Barcelona. Argentine players were leaving the yellow discipline employed by other clubs. The first to leave the yellow team was Quique Wolff, in the 76-77 and four years later, Carnevali and Brindisi do the same. Morete leaves in 1980. After nineteen consecutive years in the top flight, the Unión Deportiva Las Palmas relagation to Second Division in the 1982-83 season after a terrible season in which they finished in sixteenth position. A great time for the players was left behind and the Union Deportiva began its darkest years. So they only stay in First Division five more seasons. In the 1984-1985 season, after two years in Second division, the fourth promotion to First Division occurs, with Roque Olsen as a coach. Three seasons in which the team would play in First Division until 1987-88.
team gets the worst result in history, ranking last in the table, with a consequent relegation in the silver division. The 1988-89 season marks the beginning of the worst records of Unión Deportiva in its history. After three irregular competition campaigns in Second Division, the yellow team performs a fourth unfortunate championship and relegation to Second Division B in the 1991-1992 season. The club was not used to this situation, since they had not played any inferior to Second Division championship since its foundation. The relegation to second division risks the club coffers. The legislative obligation of professional clubs of Spanish football to become sports public limited companies or disappear causes, in no time, the governing firm should cover a debt of 600 million pesetas. The amateur, in a gesture of unconditional love for the colors, together with the unconditional contribution of Cabildicia Corporation, saves the club with generous financial contributions. Those are tough years for the yellow firm. Three consecutive failures to return to Second Division, sapping morally the fans. Finally, in the fourth attempt to return to the silver category, with Pacuco Rosales as the coach in 1995-96. The UD Las Palmas returns to Second Division, with new sport management and a solid project to return to the elite. Among the new project additions, the hiring of the argentine Jose Oscar "Turu" Flores, the most expensive signing in club history and category at that time. However, that year the promotion was very close. Three years are needed to return to the elite. Directed by the Croatian Sergio Kresic in the 1999-2000 season, the UD Las Palmas is champion of Second Division. Finally, after twelve years away from the top category, the grancanarian team returns to First Division, in its fifth and penultimate promotion. Sergio Kresic commands the 2000-2001 project in the First Division. In a season in which the yellow team seek permanence to lay the foundations for a future project in the elite, the squad remains loosely mid-table ranking. This season also means the appearance of three large pearls of the quarry: Jorge Larena, Guayre and Ángel. For the next season, Fernando Vázquez takes over the yellow ship. During most of the competition, the UD Las Palmas comes close to high positions with remarkable game. However, a second disappointing turn causes the return to the Second Division. The dream of gold category lasts only two years. Economic effort to keep the team in the First Division caused a new hole in the economy of the club. The UD Las Palmas again leaves the League of Stars, with the consequent economic loss in revenue. The new season in the second division should mean a brave act for the return, but, nothing could be further from the truth, the season is irregular. The 2003-04 competition is unfortunate and the team drop down for the second time to Second Division B. During the seasons 2004-05 and 2005-06, the sports corporation suffers a judicial intervention because of the ailing economy and a subsequent process of Bankruptcy Administration, unprecedented in Spain on a football club. Thanks to Judge Cobo Plana and the current president of the company, Miguel Ángel Ramírez, a local businessman who takes the control when nobody gave a penny for it, the Union Deportiva is saved from what seemed an inevitable disappearance. In the 2005-2006 season the club begins to cope with debts and ends with the return to Second A Division. A healthy team trying to start a future project to lead the club to its natural place, which is the Division of Honor of Spanish football that takes far too long. Since that season, until 2012-2013, UD Las Palmas remains in the League, Spanish football silver category, growing and obtaining successive permanence until the board of directors chaired by Miguel Ángel Ramírez fights for the top qualifying positions, getting the opportunity for the play off and promotion during the past three seasons in a row. Finally, "the yellow team" wins the coveted promotion to the Spanish football gold category after beating Real Zaragoza (2-0) on 21 June 2015 at the Estadio de Gran Canaria. 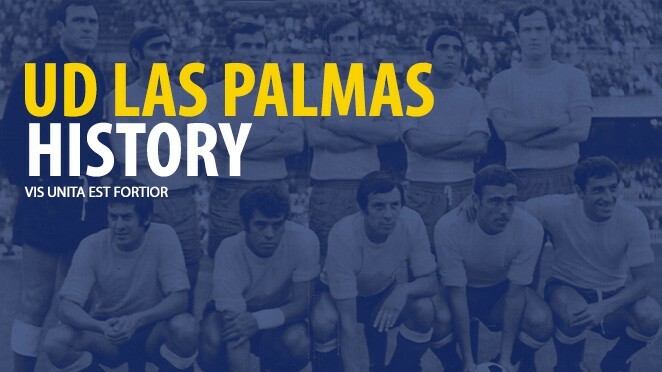 The name of UD Las Palmas emerges after a long process of discussion to choose the best nomenclature resulting from the merger of the five teams that founded it. Clearly it stipulated that the name resulting from that new club could not be from any of their founders, but a completely new one. Initially, the name of Deportivo de Canarias toyed with some force, but was soon dismissed as referred to throughout the archipelago. The possibility of just Las Palmas was contemplated, but also was scrapped due to the previous existence of a sports club with that name. There was, therefore, more hesitation. Las Palmas was born of the union of all canaries. The Unión Deportiva mentions the founding history of this great club, and Las Palmas, to their Gran Canaria roots. A name that keeps in its heart myriad of feelings and emotions, designed to write on the shiny leaves football history of this country. The UD Las Palmas uniform, was set from the start of the club's history, back in 1949, with representative colors of Gran Canaria, this is smooth yellow shirt, smooth bright blue pants, and blue socks with yellow border ; as recorded in the archives of the club. As I remember from the club history, in recent times, the second UD Las Palmas uniform, which is used by matching the colors with some other club, its rotationally corresponds to the uniformities of each of the Sports Union founders teams. Marino Football Club, Club Deportivo Gran Canaria, Arenas Club Football and Athletic Club. On the shield, a yellow ribbon with three inscriptions appears: on the left, and centered, the name of the team and, on the right, the region it represents, The Canary Islands. At the top, wears a crown, that although it is not a team with the "Real" nomenclature, it inherited this crown of one of its founding clubs, Real Club Victoria, settling as the only shield of Spanish football with this feature. His first design is done by .Mr Simon Doreste y Doreste. The first written anthem for our club was distributed as leaflets at Las Palmas Stadium before the match between UD Las Palmas and Club Deportivo Málaga. "Deportivo de Las Palmas / you are the best eleven/ no team in the world / like you a clear victor / defending your colors / struggles as a fierce lion / stronger than the “Nublo” / where you will put your blazon / Deportivo de Las Palmas / you are the fans / throwing his Riqui-Raca / to the great Spanish team. " This song did not have continuity in the club's history, and was strongly absorbed by the notes of the current anthem. It was composed in the early fifties by Gonzalo Monasterio, author of the lyrics, and the music was provided by the Master Peón Real. He was one of the first person devoted to a football team in our country, coming to achieve third prize in a song contest. There was a third attempt to anthem by the author Sindo Saavedra but it did not go deeper in the fans. 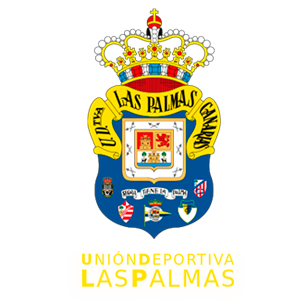 The UD Las Palmas flag consists of two horizontal stripes of equal width, yellow top and blue bottom. In the center of the flag is the shield of the firm. There is confusion with the flag corresponding to the island of Gran Canaria that although has the same colors as Las Palmas flag, the two swaths of the island flag are diagonals: the left upper part of the cloth is yellow, while the blue part corresponds to the lower right area. The new official mascot of UD Las Palmas, Pio-Pio, will cheer and entertain the yellow fans in every game played at the Gran Canaria Stadium. Over the 10 years of its existence the colourful and funny image of the canary bird adds to the many hallmarks that the club has, founded on August 22, 1949.